To set the program to email with Gmail or Google Apps for Your Domain, use the settings as in the example below. For Google Apps for Your Domain, your email address will be your username. If you are using Gmail, then the username should be your Gmail address. 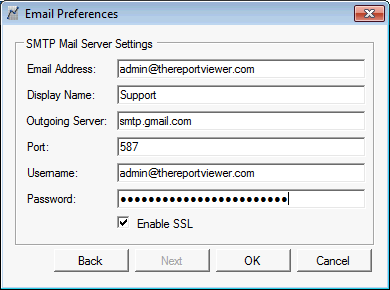 For the changes to the email settings to take effect, you will have to close out all your reports. Note that you must use port 587. Ports 25 and 465 will not work. Also note that the SSL box must be checked.